Zinc oxide-graphite composites with varying mass ratios were synthesized using the solid-state reaction method at room temperature for different reaction times. Raman and XRD spectra results show highly crystalline zinc oxide and graphite in the composite, and that the relative intensity ratios of the ZnO and graphite peaks correspond very well to their relative contents. Further analysis indicates the presence of graphite oxide with reaction time from 0 to 4 hours. Analysis of the XRD and Raman results generally showed decreasing lattice parameters for short reaction time and then increasing lattice parameters for longer reaction times. The correlation with increasing lattice parameters and decreasing crystallite size with reaction time is highly suggestive of the interaction between the graphite and ZnO through the oxygen in ZnO. M. J. Balod, R. Ngaloy, M. A. Madarang, M. Ilasin, and I. J. Agulo. 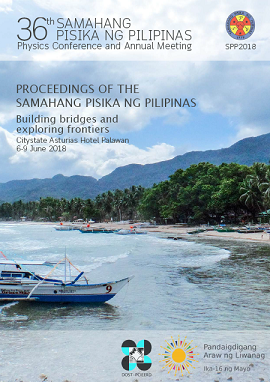 Raman spectroscopy and XRD analysis of zinc oxide-graphite composites synthesized via solid state reaction, Proceedings of the Samahang Pisika ng Pilipinas 36, SPP-2018-PA-28 (2018). URL: https://paperview.spp-online.org/proceedings/article/view/SPP-2018-PA-28.